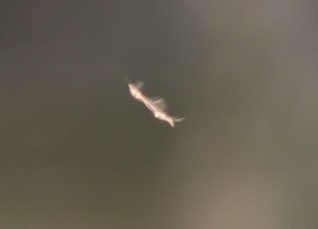 Flying rods (or simply 'rods' or 'skyfish') are flying linear anomalies caught (usually) on video, having not been seen at the time of filming. They generally have appendages along their sides. Their overall appearance is of a long straight stick with horizontal branches. Sometimes these 'branches' may have curved 'flaps' (called 'membranes' by some people) trailing behind. They occur all over the world and have even been observed being pursued by swallows! *** So what are they? Some people believe they are cryptozoological and represent a previously undiscovered form of life, maybe even of alien origin. Others think they are paranormal, perhaps related to orbs. However, many people think they are actually insects (or bugs) caught in the act of flying. 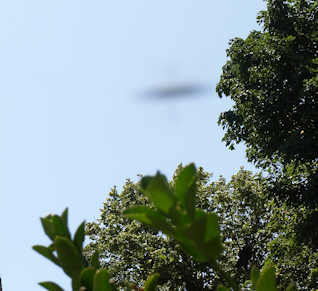 It is certainly possible to reproduce 'flying rods' by photographing flying insects (for more on paranormal photos in general, see here). Where are the blurred rods? An interesting point in the flying rod debate surrounds the fact that they are only ever caught by video (or sometimes still cameras) but never seen with the naked eye. This is usually explained by saying that they fly too fast for humans to notice. So, if these rods are flying so fast (faster than insects or birds, presumably), how come their bodies and, particularly, wings or appendages are always perfectly frozen by every camera? Shouldn't they appear as motion blurs in all but the shortest exposure times? It is inconceivable that every camera that has ever caught rod photos was set to extremely short exposure times, so where are all the blurred rods? Rods are almost always caught by video cameras (for a rod video see here and there is a still from this video in the pic right). Their distinctive shape is thought to be due to the fast flapping of insect wings causing motion blur. This is because the flapping is much faster than the relatively long frame (fields, in fact) exposure time in video cameras of 1/50th or 1/60th of a second, used in low light situations. In that time, some insects can beat their wings several times and move a significant distance in the air. In fact, typical insect wing beat rates vary between 10 and 250 per second (though some small insects have rates up to 1000/s) while flight speeds vary between 0.5 m/s and 7 m/s. So, a horsefly, for instance would beat its wings twice in 1/50 s and fly around 8 cm. This would yield a 'rod' 8cm long with two 'branches'. The apparent length of the rod on film would, of course, depend on the insect's distance from the camera (and also in which direction it was flying). So is there a way to cut through these technicalities and see if flying insects really look just like rods? Yes there is - still photography! Still digital cameras record whole frames simultaneously (when taking stills) so all considerations of interlacing, field rates, scanlines, de-interlacing algorithms etc. are removed. Another big advantage of using still digital photography is that the exposure time is automatically recorded in the EXIF information removing any arguments about 'field times'. Are rods caught with still cameras? It is rare but it happens. If you take photos with relatively long exposure times then it is perfectly possible. Such exposure times (1/50 s) are at the limit of what can be hand-held with a still camera. However, with a tripod, such relatively long exposures can yield sufficiently sharp photos. The insects would also need to be quite close and well lit (or silhouetted) to see the 'rod' structure. 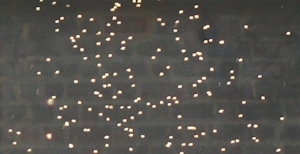 In the photo, top right, you can see a group of insects (midges) backlit by the sun in front of a dark brick building with a tree branch above. The shape of the individual insects cannot be made out, even though they are in focus because they are too small. Note that one or two insects (top right corner, for instance) show up as orbs. That's because they are a bit closer than the rest and so are out of focus. The exposure time is 1/200s. Now look at the next photo, right. The camera has zoomed in on the same group of insects. Because of that the background bricks are now out of focus. However, the insects are still in focus. The exposure has dropped to 1/40s because there is far less light available overall (due to the dark background). Look what has happened to the insects. Many are now long 'rods', their linear shape caused by the fact that they have flown a significant distance in 1/40s (several cm). The length of each 'rod' varies because it depends on the direction in which the insect was flying. Insects flying in parallel to the camera yield the longest rods. If the 'rod' effect was caused by camera movement, all the 'rods' would be the same length and be extended in the same direction. Note the extremely thin rod towards the top and slightly right of centre. This is probably a smaller insect of a different species. Now, if we zoom in on the previous photo (right, below) and enhance it a bit (increase contrast, reduce brightness, apply a little sharpening), it is possible to make out the detail of individual rods. Depending on the quality of your monitor you should be able to make out the characteristic branches along the sides of some of the rods. Counting the branches reveals a figure of between 6 to 8 on each side of the longest rods. That implies a wing beat. rate of 240 to 320 per second*. 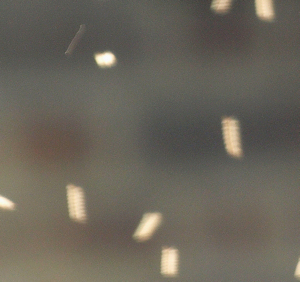 As these are midges, you would expect such rapid wing beats. Broadly speaking, the smaller the insect the quicker its wing beat rate. These photos show that it IS possible to catch rods with still cameras, with a little effort and perhaps a bit of luck. The results look very much as they do in still frames taken from video recordings. If you want to take rod photos with a still camera yourself, find some backlit insects swarming in front of a dark background. Then zoom in on them and try to get a longish exposure (the dark background should help reduce the shutter speed) of around 1/50s or longer. You will probably need a tripod to avoid camera movement. The biggest problem is likely to be getting the focus right. You may need to select manual focus and use something at the same distance as the insects to get the right focus. The whole thing will be a lot easier if you have manual override on your camera! An interesting question that arises is, why should the 'branches' of the rods correspond to wing beats? It's because most insects wings are almost transparent. They only reflect light well at certain angles to the sun (or other light source). So you only see the part of the beat where the wing 'catches the sun' and produces a bright reflection - a 'branch'. Some appendages are not straight 'branches' but more like continuous curved 'surfaces' that appear to undulate up and down (so-called 'membranes'). 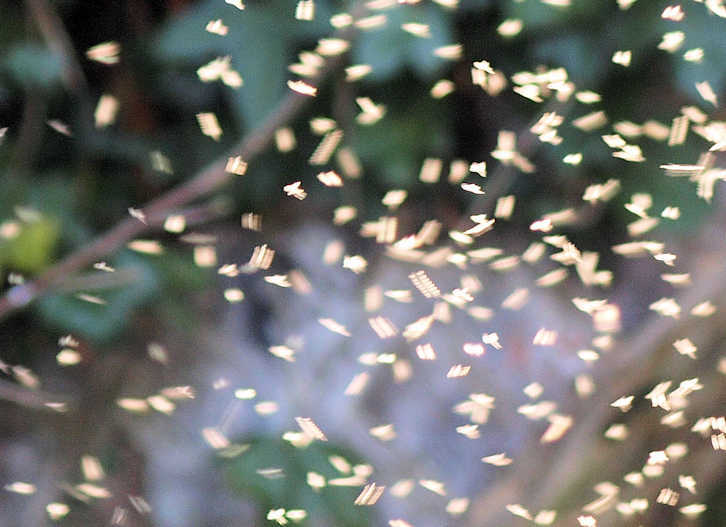 These may be caused by insects whose wings are more opaque than other species, like moths and butterflies. 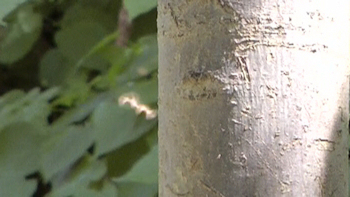 In the following section you can see a close-up of a rod showing both 'branches and 'surfaces' produced by a single insect. Flying rods come in lots of different varieties. The various forms probably reflect the species of insect from which they are derived. The most important variation concerns the appendages. While many rods have appendages coming out directly opposite each other (photo above right), others don't (photo above). Then there are some where the appendage appears to wrap around the body, like a telephone cord (photo right). In some rods, the appendages are tiny (photo right) while in others they are non-existent. These four photos used long exposures (between 1/5 and 1/10s) to produce longer rods than you would expect with a video camera. All 4 photos in this section were taken at the same time, in an area of a few square metres. The differences in apparent shape of flying rod are probably mostly to do with the angle of the camera to the flight path of the insect. Most rods are either light (often whitish) or (rarely) darkish in colour. This reflects that fact that they are either overexposed (whitish) or silhouetted (dark). 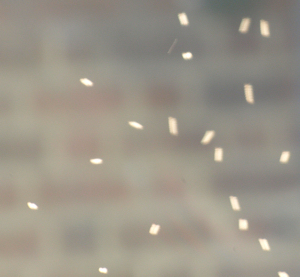 This close up photo of a flying sunlit insect was achieved with the help of a telephoto lens. To avoid camera shake with a telephoto lens you normally require exposure times that are too short to show rods. So a tripod is required for this sort of photo. You can really see the detail in this photo of a sunlit insect which used a exposure time of 1/60s. The movement of the insect wing shows up as rectangular 'flaps' on the near side. These 'flaps' correspond to the angle at which most sunlight is reflected back to the camera. They are the 'branches' familiar in many rod photos. You can also see a faint 'surface' under the 'flaps'. This is probably the bottom limit of the flapping action. It shows up because, as the wing changes direction from downward to upward it will effectively slow its motion momentarily. There is even a hint of a fainter upper 'surface' above flaps which may the highest point of the flapping action. In insect species with more opaque wings, these 'surfaces' will appear to undulate (so-called 'membranes'), replacing the 'branches' normally seen. Another interesting point is that the body of the insect itself also appears to change shape as it flies. It doesn't really change shape, of course, but it may be possible to see more or less of it as the wing flaps in and out of the way of the view from the camera. There are about 5 wing beats in this exposure, equating to about 300 per second*. The overall size of a flying rod surprises some people - how can an insect look so big? The answer is that the width is determined by the overall wingspan of the insect, which can be several centimetres, rather than its body size. The length, which is usually much bigger than the width, depends on the frame exposure time and speed of insect flight. Both dimensions also depend on the distance of the camera from the insect. This can be anything from a centimetre or two up to several metres. Not all flying rods have the classic 'rod with appendages down both sides' shape. Some still retain recognisable insect-like features. These are 'insectorods' - part insect, part flying rod. Insectorods have bizarre, ungainly, impractical shapes, often combining features of the original insect and the flying rod. In the photo (right), you can see just such an insectorod. It is a very peculiar looking object. It resembles a flying rod, in that it has a central 'rod' with appendages, though only on one side. However, it also resembles an insect, in its wings. Bizarrely, this insectorod appears to have two insect-like wings on the same side of its 'body', as well as a strange 'fish-tail' (a skyfish indeed!). 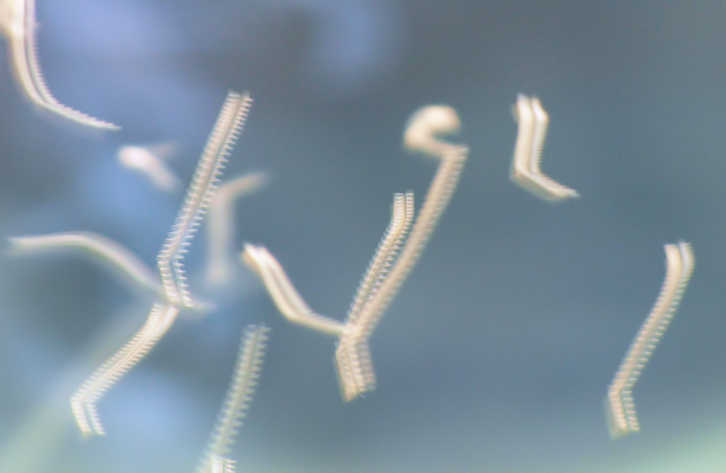 The photo, which had an exposure time of 1/50s, is actually of a single small insect flying along. During the exposure time the image of the insect body was extended to form a light trail - the 'rod'. Meanwhile, the 'membrane' appendages are the insects wings, frozen at the only point in their flapping motion where they reflected significant amounts of sunlight. In this case, that was only on one side of the 'rod'. The 'fish tail' is probably caused by another flap of the wing which happened to be in progress when the exposure started, so that it is only partially seen. By taking many photos of insects, such as when they swarm (illuminated by sunlight), you can sometimes catch one or two strange insectorods among the many 'ordinary' flying rods. 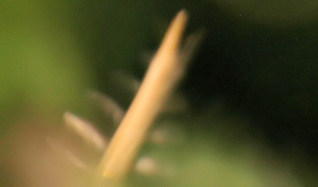 Insectorods happen when the photographic exposure just happens to catch an insect at an unusual angle to the light or changing direction of flight or oddly illuminated (as here). The highly unlikely form of the insectorod betrays its insect origin. In the second insectorod photo, right, the beast appears to have three wings but only on one side! 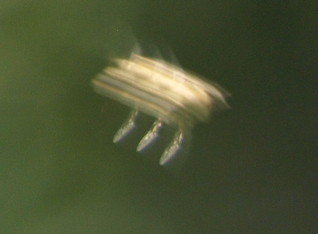 With an exposure time of 1/200s, it was formed in a similar way to the other insectorod above. This one apparently has strong body stripes and faint vertical fins! There is probably an endless variety of unlikely insectorod forms that can be pictured by a persistent insect photographer. This photo is much more insect than rod. The only 'rod' aspect is the blurred wing. Notice how the beating wing appears translucent or diaphanous. This shows how the 'membrane' type of rod appendage is formed. Contrast this with the photo immediately above, where the insect wings have been frozen. This happens when the wings are at the right angle to reflect sunlight strongly towards the camera. The extra light enables the camera to capture the wing instantly, like using a flash. With the bee picture, there was never an angle where the sun reflected strongly back to the camera so the wing leaves only a faint impression (except at the top and bottom of the beat where it lingers just a little longer as it reverses direction). Exposure time is 1/200s, which shows just how fast bees beat their wings! insects at different distances (some in focus, some not) from the camera and flying in various directions. Some of the insects are flying side-on and appearing as classic flying rods. The exposure time is 1/40s which is shorter than the longest used in video cameras (1/50s). Some of the insects have bizarre hybrid shapes (insectorods). Most of the insects in the photos on this page were very small (midges). These usually produce flying rods with characteristic straight 'branches' down each side. Larger insects, like bees, can give rise to 'membrane' type 'wings' when they appear as flying rods. A honey bee produced the rod in the photo (right) here. Note the different 'appendage' shape and colour compared to the photos above. 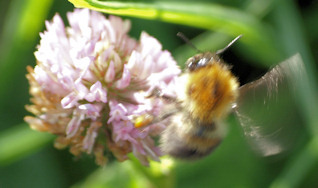 The body of the bee has become an extended blur with two distinct halves. 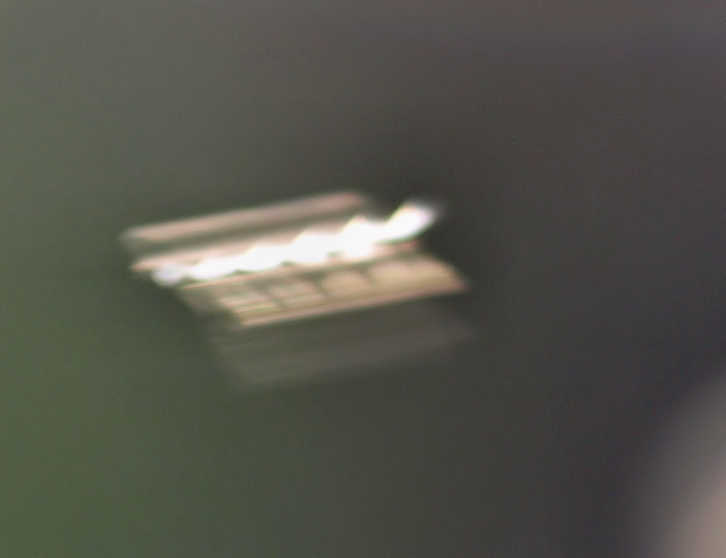 You might just be able to make out faint wing shapes on either side on the central blur. The exposure time on the photo (right) was 1/30s, which is actually slightly too long for a video camera. 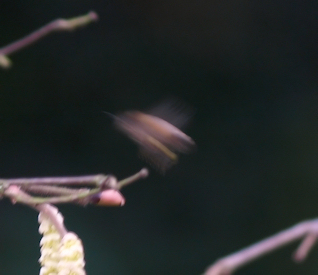 However, this bee was flying rather slowly, manoeuvring lazily between catkins. A bee travelling between food and a hive would go rather faster and could easily appear as a flying rod in a video. The photo above is cheating, as far as video is concerned. The exposure time is a massive 1/8s, far longer than the 1/50s that video cameras can manage. But still cameras have no problem with it at all (provided you're using a tripod). Look how long the flying rods have become. Just as you'd expect, the longer the exposure the longer the rod! Also, note that over the 1/8s most of the insects change the direction of their flight. In fact, few insects fly in a straight line for very long. This rod was produced by a hoverfly. The exposure time was 1/60s which is within the range of video cameras. 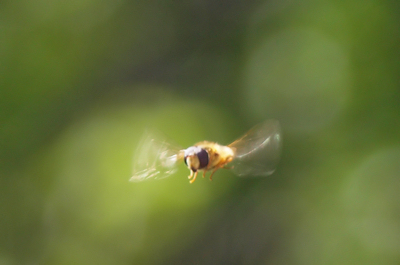 It was caught accidentally while photographing a stationary hoverfly, which then flew off. Note how different it looks to the other rod photos here. It seems likely that there may be many different rods whose shape and colour are determined by the insects that form them (as well as the lighting conditions). Many rods look whitish which is simply because they are overexposed. In the next photo, a couple of flying rods were caught just above a slow flowing shallow river. The scene is dark because it is shaded from the sun by overhanging trees. The rods themselves show up well because they are catching the sunlight. The horizontal rod has its reflection on the water just below. It may be a water boatman or pond skater, or some other insect that swims along the surface of the water. If it is an aerial insect then it is flying dangerously close to the water! The exposure time is 1/30s which is a bit slower than a video camera could manage. The next photo is a rare example of a dark flying rod. Most rods are bright and are often photographed against a dark background. By contrast, dark rods are usually taken against the daylight sky, or some other bright background. Because the photo is bright, the exposure time is faster than usual for rods, 1/200s in this case. That is why you can only see one faint set of wings (or appendages), above and below the body. 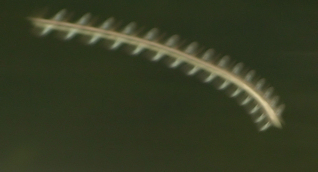 The most rod-like feature is the clearly elongated torpedo-shaped 'body' created by the insect's movement. The insect is also out of focus, unfortunately. In almost every case, flying rods are insects that are in focus. This kind of photo generally requires a good depth of field and a very close insect to get a reasonable flying rod shape. 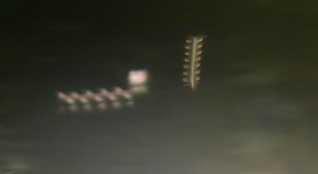 Given all the factors that need to come together to produce this type of photo (as outlined above), it is not surprising that it is much rarer than the bright rods. This photo is a hover fly. It is not technically a flying rod as you can plainly see the insect's body. The body is easily visible because the fly is hovering. What is interesting is that the shutter speed was 1/320s. And yet the wings are still moving so quickly that they are smeared into diaphanous appendages, just like a flying rod. This may mean that video frame exposures longer than 1/50s can still produce flying rods. So videos of flying rods may not be confined to low light recordings. It is possible to get the rod effect with things others than insects. 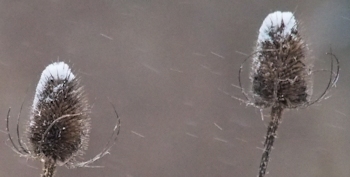 For instance tiny snow flakes caused the rod shapes in the image below. The falling snow was barely noticeable at the time of exposure and could easily be forgotten before the photo was examined in detail. The exposure time was 1/250s, longer than typical rod photos. * Of course, it depends how you define 'wing beat'. If you mean the entire movement cycle from top to bottom and back again, the wing will reflect light strongly towards the camera twice (once on the way down and then again on the way back up) over that period. In that case, divide the figures given here by two to get the number of wing beats per second. ** For a full discussion of these technical issues, see Sol's Bugrods . *** Swallows feed on insects by catching them on the wing!